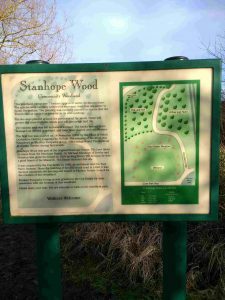 Stanhope Wood was planted on disused farmland following the building of the A50 trunk road. The Forestry Commission funded the scheme for us. 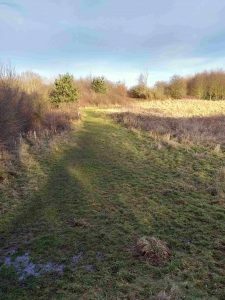 They planned the woodland to look as natural as possible in its surroundings, using trees which are native to South Derbyshire. In November 2003, the Chair of South Derbyshire District Council, Cllr M Bale planted the first tree for us. We then planted 1100 oak, ash, hazel, willow, spindle and dogwood. Two protective hedges were later planted by the young people in the village, and a further 500 native ornamental trees were added. In April 2005, the Lord Lieutenant of Derbyshire, Mr John Bather, kindly planted the last tree for us, thus marking the end of the first phase of the project. The Group have put a bench in the glade to help people who may want to spend some time there. There is also an information board which explains the history of the area. We have sown a wildflower bank at the entrance to the wood and have planted wildflowers under a mature hedge which lies within the wood. This newly created conservation area can be found alongside the sewage treatment works in Commonpiece Lane, Findern. It was created from a piece of land which was deemed unsuitable for farming after the A50 trunk road was built. The Group are grateful to the landowners, the Cox family for their help with this project. Our first task was to clear the site. At this point the grass was shoulder high! We were delighted to discover a small pond at one end of the field. A mown path was marked out, and native trees and shrubs were planted. Later, we planted wildflower bulbs and plants under the trees. Bat and bird boxes were put in the trees and an insect hotel and a mammal cairn were added. Although the pond is small, we have developed it to create a habitat for mammals, birds and insects. In the autumn of 2004, we enlarged it using machinery and then carefully shaped the edges using hand tools. The pond has been planted with a variety of native pond plants, including arrowhead, flag iris, forget me not, smock, marsh marigold and water mint. A pond dipping platform has been installed by the BTCV, and we are grateful to them for their help. It has been built from plastic wood, which is in fact made from plastic milk cartons! We have put a bench seat alongside the pond and have installed a gate and pathways which will allow walkers and wheelchair-users to enter the area more easily. The final touch was an information board which we hope will promote the diversity of wildlife in the area. Please enjoy this conservation area and remember the countryside code.